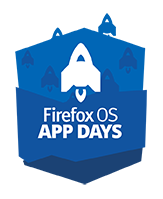 If you’re a developer interested in web technologies, I’d like to invite you to participate in Firefox OS App Days, a worldwide set of 20+ hack days organized by Mozilla to help you get started developing apps for Firefox OS. At each App Day event, you’ll have the opportunity to learn, hack and celebrate Firefox OS, Mozilla’s open source operating system for the mobile web. Technologists and developers from Mozilla will present tools and technology built to extend and support the Web platform, including mobile Web APIs to access device hardware features such as the accelerometer. We’ll also show you how to use the browser-based Firefox OS Simulator to view and test mobile apps on the desktop. Firefox OS App Days are a chance to kick start creation of apps for the Firefox Marketplace, and represent a great opportunity to build new apps or optimize existing HTML5 apps for Firefox OS, as well as demo your projects to an audience of peers, tech leaders and innovators. We’re exciting to be working with our Mozilla Reps, who are helping organize these events, and with our partners Deutsche Telecom and Telefónica, who are supporting a number of them across the world. 08:30 – 09:30 Registration. Light breakfast. 09:30 – 11:30 Firefox OS, Firefox Marketplace & Mozilla Apps Ecosystem. 11:30 – 12:00 Video. Q&A. 13:00 – 17:00 App hacking. 17:30 – 19:00 Demos & party. Plan on bringing your Linux, Mac or Windows development machine and an idea for an app you’d like to develop for the Firefox Marketplace. If you have an Android device, bring it along, too. You can see the Firefox Marketplace in action on the Aurora version of Firefox for Android. If you want to get started before the event, review the material below and bring an HTML5 app that you’ve begun and want to continue, get feedback on or recruit co-developers for. Would love to join! Unfortunately no events in Switzerland and no time going to Germany due to my semester exams.. Anyway, hope there will be some great apps created during those days. @platzh 1 rsch Thanks for your kind words, sorry you can’t join this time. Harrison, sorry we missed you for this round! Learned a lot at the event this past weekend in Mountain View. Thanks for having me. Anyone interested in FxOS should definitely try to attend one of these events. Such kind of events much be done online and recorded as well so everyone can watch them even if they can’t attent it or these sessions not done in their country. Although this event is held in Banglore, India, I can’t join because of some other schedule. I am craving to join this event, but I will have to wait for the videos to be published. and yeah, as Fawad Hassan said, this type of event should be online. The event in Nairobi today was Great! Thanks for the chance and the knowledge gained! I am now a part of the open web! Good to hear, glad you liked it!